I doubt much needs to be said. At first glance, it just doesn’t make sense or will seem silly to many outside the Islamic world. 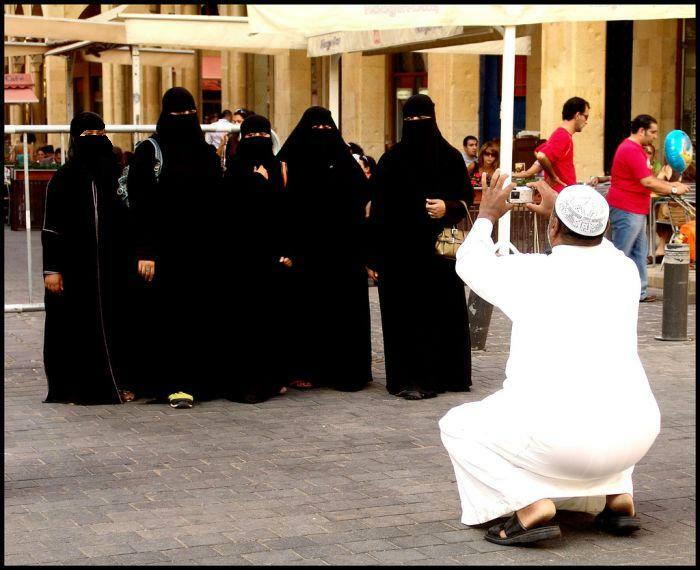 Why would the women want a picture when they are hidden from view? How can anyone who looks at it know who is there? Isn’t taking a photograph of individuals who can’t be seen self-defeating? Well, yes and no. Yes for some, but obviously not for those in the picture. They know who they are. And there are subtle inversions created just through the act of having the picture taken: The man taking the picture is squatting–and the rear view is not entirely flattering–while they stand. He is in the position of serving them, while they enjoy the privilege of enhanced visibility. He can be forgotten while they will be remembered. If, that is, they asked for the picture. If this is his idea, all bets are off. Which is another reason I find such images so interesting, as they call into question many of the assumptions we bring to bear in our ordinary viewing. Were the women not veiled (as a women in the background is not), we could safely assume we know the story, particularly as we would be cued by any facial expressions. Of course, our assumptions would still be just that, but the odds would be pretty good. Here we quickly realize how much we depend on such assumptions and how they are culturally parochial. Note also how the image may naturalize the burqa. The comic effect (which comes, I think from both the basic contradiction and the man’s pose) moderates the threat that visible invisibility can create in a public space. And after all, their invisibility is being undercut by the act of having the picture taken. Most important, the veiled women are being placed within a very familiar visual practice: snapshot photography, and there the habit of having our pictures taken (often by strangers, no less) while vacationing with family or friends. If the burqa can be incorporated into this common habit (so to speak), it can’t be too bad. And just as snapshots taken in public spaces suture private and public life, so does this photograph integrate liberal and non-liberal conceptions of public visibility. ← Previous Post"The Emperor's Clothes …"
Next Post →What Does Peace Look Like?